Outdoor advertising company Clear Channel has launched ‘Human vs Machine’, a quiz game designed to begin getting consumers used to the idea of interacting with its new network of 10,000 advertising panels equipped with NFC tags. To participate, consumers use their phones to tap or scan hotspots next to posters featuring ADi, a robot quizmaster, and are challenged with three technology-based questions. Those who answer all three questions correctly are entered into a prize draw for a chance to win £1,000 worth of technology vouchers. “The Human vs Machine game is a fun and free way for people to familiarise themselves with the interactive tags that have sprung up at thousands of bus stops right across the UK,” says Matthew Dearden, chief executive of Clear Channel UK. 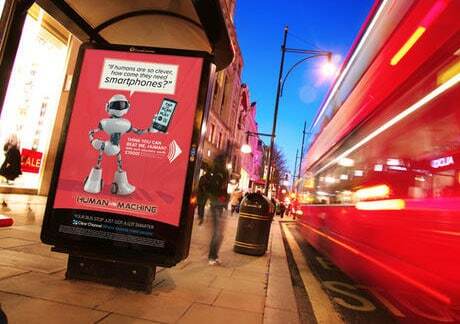 The Human vs Machine campaign runs until 3 May.